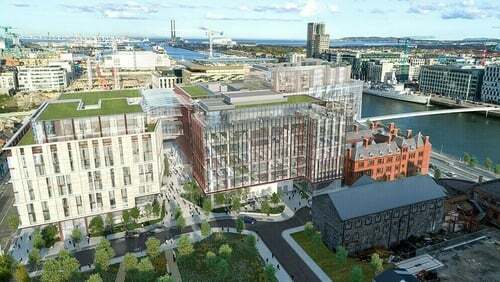 The company also revealed details of a new campus it is developing in Dublin's docklands. The company's 1,400 existing employees and the new hires will begin moving into the new office, being developed by Ronan Group Real Estate and Colony Capital, in mid-2021. The deal with Ronan Group Real Estate and Colony Capital is the largest ever office letting in Ireland. It comes after RGRE and Colony agreed to lease the entire Fibonacci Square scheme in Ballsbridge to Facebook as its new EMEA headquarter building last November. As part of today's announcement at Dublin's Convention Centre, the company announced that its philanthropic arm, Salesforce.org, is giving a grant of $1 million (€878,000) to Educate Together. The event was attended by 1,000 of the company's employees and Taoiseach Leo Varadkar. The new office will act as a regional hub for the firm's employees across sales, customer service, technical and business operations. The announcement represents one of the largest jobs investments in Ireland in recent years. Salesforce Tower will be one of the most sustainable office campuses in the world according to the firm. It will feature an immersive video lobby, riverside paths and an open hospitality area space for employees and customers. The local community will also be able to use it for free at weekends and evenings. We’re thrilled to share plans for a new campus in the city, the creation of 1,500 jobs and a $1 million USD grant to Educate Together! Salesforce has been in Ireland since 2000, when it set up a small team to provide multilingual pan-European technical support. This was quickly followed by an inside sales team. In 2012, the firm announced it was creating 100 positions in the capital to meet the demands of continued growth in Ireland. On that occasion, the company sought to hire qualified professionals in sales, marketing, IT and customer support. A year later, it announced it would recruit a further 100 staff here and opened a second 50,000sq/ft office in the city. Today it employs around 1,400 people at its regional hub in Leopardstown in Dublin. Salesforce provides services to 150,000 companies around the world and employs around 30,000 people. The company was founded 20 years ago by former Oracle executive, Marc Benioff, who is now estimated to have amassed a personal fortune of over $6bn. The firm has estimated that it will have revenues of up to $16bn this year. "We were one of the first digital companies to locate in Dublin, and since opening here we have seen the city flourish into one of the world’s leading technology hubs," said Dr David Dempsey, Country Leader for Salesforce in Ireland. "We are proud to be part of this story and look forward to taking up residence in the very heart of Dublin’s Silicon Docks," he added. Speaking at today's jobs announcement, Taoiseach Leo Varadkar said the investment would, at a time of economic and political uncertainty, be seen as a vote of confidence. "Salesforce has become an important part of out technology ecosystem and is helping Ireland become the tech capital of Europe, with Dublin at its heart," he said. Foreign investors backed by IDA Ireland created a total of 14,000 jobs in Ireland in 2018, up from just over 10,000 the previous year, the agency said earlier this month. Foreign firms employed around 230,000 people in Ireland in 2018, approximately 10% of the country's workforce.